Bettina (as well: Bettine) Brentano was a writer, publisher, composer, singer, visual artist, an illustrator, patron of young talent, and a social activist. She was the archetype of the Romantic era’s zeitgeist and the crux of many creative relationships of canonical artistic figures. Best known for the company she kept, she numbered among her closest friends Goethe, Beethoven, and Pückler and tried to foster artistic agreement among them. Many leading composers of the time, including Robert Schumann, Franz Liszt, Johanna Kinkel, and Johannes Brahms, admired her spirit and talents. As a composer, von Arnim's style was unconventional, molding and melding favorite folk melodies and historical themes with innovative harmonies, phrase lengths, and improvisations that became synonymous with the music of the era. She was closely related to the German writers Clemens Brentano and Achim von Arnim: the first was her brother, the second her husband. Her daughter Gisela von Arnim became a prominent writer as well. After being educated at a  In 1807 at Weimar Bettina made the acquaintance of Goethe, for whom she entertained a significant passion, which the poet did not requite, though he entered into correspondence with her. Their friendship came to an abrupt end in 1811, owing to Bettina's behaviour with Goethe's wife. In 1811 Bettina married Achim von Arnim, the renowned Romantic poet. The couple settled near Berlin and had seven children. Achim died in 1831, but Bettina maintained an active public life. 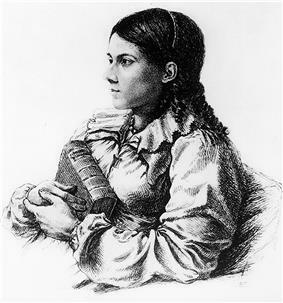 Her passion for Goethe revived, and in 1835, after lengthy discussions with the writer and landscape gardener Hermann von Pückler-Muskau, she published her book Goethe's Correspondence with a Child (German: Goethes Briefwechsel mit einem Kinde), which purported to be a correspondence between herself and the poet. The book is in large part fictitious. Genuine sonnets of Goethe in it were addressed, not to her, but to Minna Herzlieb. As a work of fiction, the book has been praised. ^ Hirsch, Helmut (1987). Bettine von Arnim (in German) (6th ed.). ^ Lyman Wight's Mormon Colony in Texas excerpt from "Mormon Trails" chapter in Hill Country travel guide by Richard Zelade. Accessed 6 August 2007.